I thought it was the best article of the 20-30 I read for this week and the best one to use on Episode #1. There are tons of data moving through social platforms everyday as businesses understand customers when they’re not talking to them. Listening, with goals in place, improve sales and lead gen because you get the opportunity to listen to customers when you’re not talking directly with them. Problem is, even with expensive listening tools most businesses are not leveraging the power of because they’re not analyzing that data. 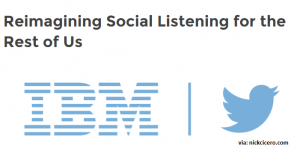 IBM’s Watson Analytics is working with Twitter in a new partnership that can show visualization of trends that they can correlate with company end goals. 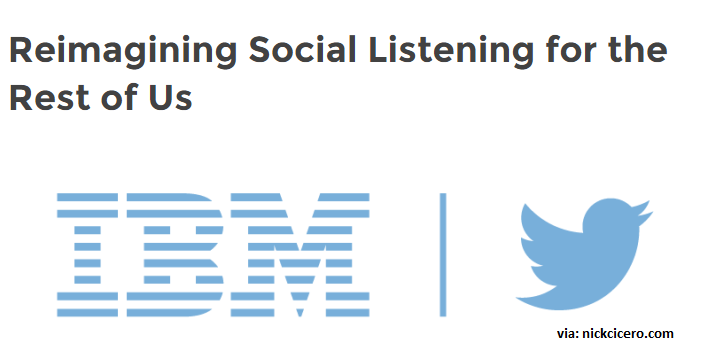 Companies can make listening something that’s integrated into the fabric of multiple teams, not just the social team. How to use listening data from customers when they’re not talking to you. This is the future of decision making. Most companies simply aren’t listening because it seems like such a daunting task. Most analysts would tell you they spend 80% of their time collecting data from multiple channels and only 20% actually analyzing it. Decisions can now be made faster and with greater information and context than ever before.